You just hate Mondays more passionately than ever. Sometimes you fancy leaving your office cubicle for an outside offer to do a job you really like. But then, you’re grounded by the reality that it’s not so easy to compete with younger and more experienced applicants out there. You find it hard to believe if there is such a career change that will work for you. Pause there, you might be missing out the whole thing. The fact is that if you’re not into the work you have now. You’re only moving forward to a dead end. Whether you are climbing up the corporate ladder or not, chances are you will still end disappointed if you don’t pursue a career you like. 1. Do you find purpose despite your challenging tasks? If you’re all stressed up about your tasks, or if you just don’t find the results of whatever you’re doing as an employee, hang in there and keep trying. The desire to find another career may just be a mere reaction to all the pressure and frustration you’re experiencing. On the other hand, if you’re already plain worn out and uninterested in keeping your performance well, that is another case. Being unable to be concerned about the quality of your output may be a sign that you don’t want the job anymore. 2. Do you think that you are being compensated according to your expertise? The skills required to do your tasks simply do not match with what you earn – this a bad (and often common) case of lack of motivation. Don’t believe if anybody says that it only means that you don’t deserve your post and you’re just up for the money of it. In the first place, you applied to make a living right? Whatever they tell you, there is a clear boundary between greediness and not being compensated accordingly. If it’s the latter, seek for a change that actually works for you and ignore the risks. 3. Do you still find your work exciting? What are the things you’re looking forward to about your job? If you’re still into the job, you will still find things to hope for even if you’re going through a hard time. However, if the things you are excited about aren’t related with your tasks, then, maybe, it’s time to look for another adventure. 4. 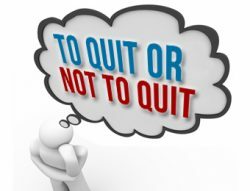 How many times have you thought of quitting your job and when? Have you thought of it a few times when you’re going through a really big trouble? Or is it too often and you just can’t find happiness in every little thing you do? If you answered yes to the latter, then your case is a signal to find something more worthwhile to spend your days with. Answering this four-way test is as easy as pie. However, the hardest part of it is finally doing something about an unhappy work life. The first step in finding the career change that will work for you is always the hardest to take. Are You Afraid to Make a Career Change?